How to send a post card and ... To find this, walk up the main street passing the tea park to the junction at the top where you will note a blue telephone box on the left hand corner. Turn left and the PTT is just a couple of blocks down on the left. The PTT in Turkey is designated by the yellow and black sign outside the building. Open seven days a week from 8.00 to 17.00. You can buy telephone cards and stamps from here in order to contact your folks back home (please note that Akyaka's post office does not have change facilities). A 1 00 unit card may be best when calling the UK -it lasts about 1 1/2 minutes and a little longer after 22.00 and on Sundays. The STD code is 0044 then deletes the preceding 0 from the number you wish to dial. 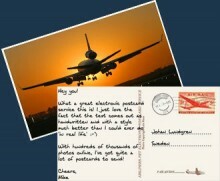 Stamps for postcards cost about 40p and take about one week to reach the UK. You will also see the blue telephone kiosks scattered around Akyaka. If you press the display language button it will show instructions in English (Thank God for technology! ).